I EMPOWERED AMBITION WHEN I REPRESENTED A GROUP OF Adults with Disabilities WHO WERE BEING DISCRIMINATED Against BY THEIR COMMUNITY AND COULD NOT SPEAK FOR THEIR RIGHTS. We were successful in our federal lawsuit in allowing them to secure proper housing in the neighborhood of their choice, despite objections from local officials. The world’s largest HR solutions company. An international public logistics company. A leading trade organization representing the IP rights of international software companies. A famous apparel and footwear manufacturer. A regional wire manufacturer and distributor. A renowned national golfing organization. Developing a litigation strategy that maximizes our clients' goals with a detailed understanding of their business. Quickly understanding and then solving our clients' litigation problems. Maximizing our clients' litigation positions to achieve their short and long-term goals. I am ranked by Chambers & Partners as a leading Intellectual Property Attorney. I am ranked AV Preeminent by Martindale-Hubbell. I am recognized by the World Trademark Review WTR1000 for enforcement and litigation. 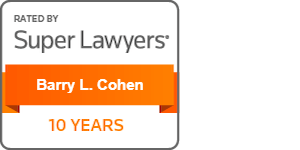 I have been selected as a Super Lawyer every year since 2009 and in 2012 was a Top 100 Attorney in Pennsylvania. I am frequently called upon by CNBC to provide commentary on cutting edge IP issues. I am a Fellow of the Temple University Academy of Advocacy. I am a Fellow of the American Bar Foundation. When I am not spending time with my teenage twins, I am training for triathlons in hopes of reversing time. I have a “little brother” from Big Brothers/Big Sisters of Philadelphia, who is a West Point graduate and a current Major with U.S. Army Rangers.